this was the king who knew the countries of the world. he brought us a tale of the days before the flood. he engraved on a stone the whole story." Single philosophers and scholars already in antiquity noted and philosophized about layers found in some outcrops of rocks. Recognizing fossils as remains of once living sea creatures, some of the Greek philosophers hypothesised that the conformation of land and sea changes over time, and Muslim scholars described the layering of rocks and explained them by accumulation and deposition of rock fragments. But these great ideas were proposed by single individuals or small groups, and no consistent school of thought or even culture dedicated to the study of rocks developed, most knowledge arise, and soon got lost, and had to be rediscovered again and again during the following centuries. For example the Italian Renaissance artist and naturalist Leonardo da Vinci studied sediments, their fossils and their stratification on the hills of Tuscany, Romagna and the Po River plain, during his service as an engineer and artist at the court of the Duke of Milan, from 1482 to 1499. From the private notes that Leonardo wrote, it appears that he understand the mechanisms of sedimentary erosion and deposition, that superimposed layers were formed at different times and that distinct layers of rocks could be traced over long distances. This empirical knowledge was "applicated" by da Vinci in some of his paintings, when the landscapes in the background of a scene displays outcrops of rocks represented correctly with sedimentary layers. However da Vinci never published his ideas and it is even questionable if he shared his observations with other persons. It was the work of the physician Georgius Agricola, latinized version of the German name Georg Bauer (1494-1555) which for the first time contributed to a broad diffusion of applied strata geology. His book "De Re Metallica" ("On the Nature of Metals"), posthumously published in 1556, is a systematic study of ore deposits, the order and extant of strata and especially mining technology, and was to remain the standard text on mining geology for the next two centuries. Agricolas work, as remarkable as it is, was however following the tradition of his times and so mostly specific and descriptive in its content, it offered little or only metaphysic explanations how layers form and how to study them. Fossils are the remains of once living creatures, comparable to modern ones, typically found in sedimentary rocks. Layers of rock are arranged in a time sequence, with the oldest on the bottom and the youngest on the top, unless later processes disturb this arrangement (principle of superposition). Layers of rocks are deposited in a horizontal position; any deviations from this position are due to the rocks being disturbed later (principle of original horizontality). A stratum is deposited continuously unless some other solid body stood in the way (principles of strata continuity). If a body or discontinuity cuts across a stratum, it must have formed after that stratum (principle of cross-cutting relationships). Fig.1. Stepwise facies restoration of Tuscan geology based on Earth strata sedimentation and deformation (Niels Steno´s 1669 Prodromus). Steno explained inclined strata (contradicting his principle of original horizontality) as results of cave collapses or other disturbances. Note also that Steno positioned the single figures to form a sort of cycle of deposition, erosion and collapse. These simple and general applicable rules could enable naturalists to develop a sort of protocol to be followed when studying sediments, and more important introduced "time" in a stratigraphic succession. However Steno's work, like many other before him remained for almost a century forgotten. But then John Woodward, considered an amateur physician and naturalist by some, by others a quack, used/stole the principles formulated by Steno in his 1695 book "An Essay toward a Natural History of the earth". The best part of work thought to support the idea of the biblical sin flood as origin of fossils, was regarded the passages copied from Steno. 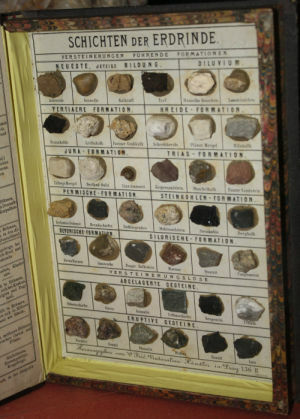 The shameless book of Woodward however initiated a new interest in the formation of sedimentary rocks and a dispute begun on the origin of fossils. 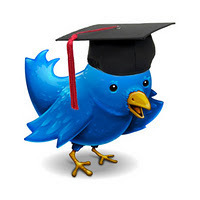 The ideas of Steno were introduced in the academic establishment and adopted in applied mining geology. Fig.2. 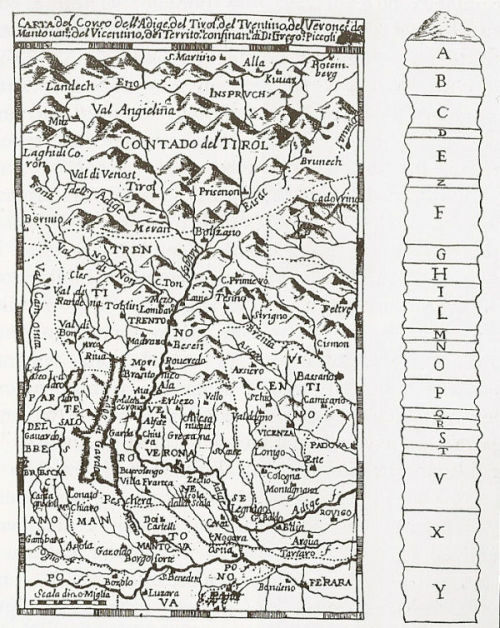 In a booklet with the title "Ragguaglio di una grotta ove vi sono molte ossa di belve diluviane nei Monti Veronesi (Description of a cave in the mountains of Verona where many bones of beasts from the deluge can be observed)" the engineer and cartographer Gregorio Piccoli del Faggiol (1680-1755) in 1739 published a topographic map of the Italian Dolomites correlated with a sort of stratigraphic column. In this column layers of lithologies only some meters thick were depicted as seen in sequence in the field. This work, nearly forgotten at its time and today, is maybe the oldest figure of this kind. 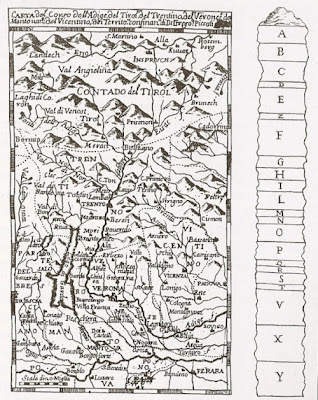 With the formulation of general applicable rules first representations of stratigraphic column appeared at the end of the 18th century; in 1760 the Italian geologist Giovanni Arduino proposed to classify the rocks of the Alps in four distinct layers - primary, secondary, tertiary and quaternary sediments. However the term stratigraphy, as the study dealing with the processes that form sedimentary layers, was coined only in 1849 by the French Palaeontologist d'Orbigny. Despite the recognition of the principles controlling a succession of layered rocks, the formation of the single strata remained still a mystery. During the 18th and 19th century two models prevailed, the Neptunistic approach proposed that rock strata were crystallized deposits precipitated in a distinct order from sea water, later erosion and modern deposition played a minor role in forming sediments. The Plutonistic approach in contrast stated to erosion and deposition the major role in stratified sediments formation, all rocks are in principle of volcanic origin, and became later eroded and the resulting sediments deposited, there was not so a strict order to observed in the succession of rocks. The controversy continued for years, no follower of one or the other idea could prove the stratigraphic order necessary for his model. Both models had to deal with the major problem of geology at these times: Geological maps depicted simply the prevailing rock type of an area, connecting single outcrops consisting of the same lithology and implying a spatial homogeneity with surprisingly little diversity and stratigraphic order. 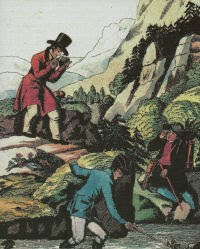 It was the self-educated engineer William Smith (1769-1839) to become the decipher of the code hidden in the rocks itself. He recognized that superficial identical strata differ in their content of fossils - fossils, regarded until them only as curiosities, beautiful, but worthless, became like the numbers on the page of a book an indispensable tool to bring order in the chaos of rocks. Fig.3. 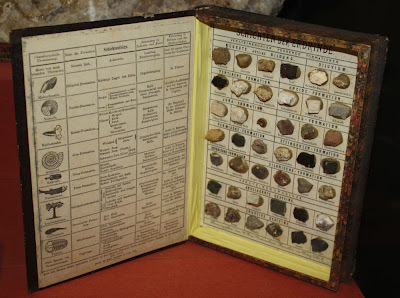 Chronostratigraphy and collection of typical rocks and fossils of the ages of earth - The Layers of Earth as book by Y. Fric, dealer of natural products, Prague 1861 (Collection of the Ferdinandeum in Innsbruck). Outcrops cold now be correlated not only by their lithology but even more precise by their faunal assemblage. Smith applied this principle to publish some minor maps in 1799 and then the first large-scale geological map with profiles in 1814-1815, depicting southern England and Wales. His example was soon followed (some say more appropriately copied) by English geologists and by the French naturalists Cuvier and Brogniart, who in 1808 published "Essai minéraligique sur les environs de Paris", a work dealing with the geology of the basins surrounding Paris and completed with a map and geological profiles. However a detail of the French publication reveals that yet the revolutionary insight of Smith's work wasn't fully grasped by the scientific community, the legend of the geological map doesn't show the lithologies in their stratigraphic (temporal) order like modern maps do, but are arranged by convenience. Thanks a lot for this, David, it answered my question about when the time concept came in - Steno first, and then the major enhancement of the idea by Smith, as I have understood it. I am interested in the effect this had on people's ideas about the age and origins of the earth. Clearly, the idea of long ages came in with this. But what about the idea of a starting point? At what stage did people recognise that there seemed to be a lower limit to the strata - ie the Cambrian? And did this firm up the idea that life on earth had a start, contrary to Aristotle, say?